Accommodation varies, with a wide range of apartments and houses (villas). A lovely bay, made up of a pedestrian area (formally a typical road with pavements either side), in front of a wide selection of bars and restaurants, with residential accommodation (apartments) above. With a small beach, below. Apartments, either overlook the sea to the front or the courtyards behind. Often on the smaller side, as building are pretty slim. But with some larger ones at the eastern end, opposite the small playground and church forecourt. Making for a busy environment during summer and a very quiet scenario, during winter. Many roads peel back from the beach all the way to the railway track, in front of the road to the main town and railway station. With lots of apartments and occasional house (villa). Most without sea views, but within easy walking to the beach and some with courtyards and pools. Many overlook a wide or partial view across the Aiguadolç bay and the boats. To the East with a sizable beach next to the community at Carrer De La Marina Aiguadolc. Private complex located on the seafront, just meters from sizable beach next to Sitges Marina (port de Sitges Aiguadolc). With it’s small supermarket (corner shop prices), restaurants, Disco & many Bars. 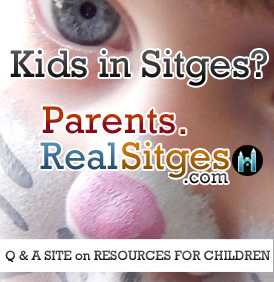 Q: Hi everyone, places to rent or share in or around Sitges. I’d like to be closer, for social life, but also for setting up an ‘eco-design learning centre’ with a small botanic garden: a collection of outdoor orchid plants which need good sun in the winter. It’s a challenge that needs some creative networking! You can be further out on the hills surrounding Sitges and get both a distant town/sea view and terrace, relatively cheaply. Anywhere with a short walk to the action, in Sitges, will be obviously costly. Especially if you throw in a decent view… and lots if a sea view. As many in town have no view, as they overlook other properties/walls a few feet away! Some with a small balcony (presume you dream for more than a window ledge in the sun :). Getting a proper terrace, can happen, by choosing a cramped location, but where you have the roof (with views or not). Suitable for lots of plants. Cheapest overlooking other roofs/no real view. For an outside area, I would look at Port D’Aiguadolc (SitgesMarina.com). As whilst it’s a cramped development, hence often cheaper than one would imagine, there are some gems there.